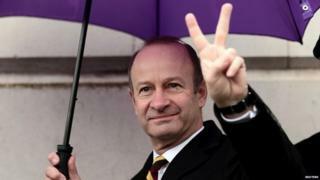 UKIP members will vote later on whether to back or sack leader Henry Bolton. An extraordinary general meeting in Birmingham will decide the fate of the former army officer, who has been in the job for less than six months. He has faced calls to quit since it emerged his partner Jo Marney sent racist messages about Meghan Markle. But he has won the backing of ex-leader Nigel Farage who said “for all his faults”, removing Mr Bolton would hasten UKIP’s path to “irrelevance”. Mr Farage has warned the party – which won 12.6% of the vote in the 2015 general election but has been in a tailspin ever since – was in danger of “collapsing” and it might be “too late to save it”. Mr Bolton has come out fighting on the eve of the vote, saying he is the man to “reform, professionalise and unite” UKIP. But Paul Oakley, general secretary of UKIP, told the Today programme Mr Bolton had let the party down. Mr Oakley said he was also concerned by the lack of campaigning ahead of May’s local elections. “We’ve done nothing. Henry will be out after the local elections if he isn’t out today,” he added. Several senior figures, including former leader Lord Pearson, have called on party officials to prepare for the future by uniting behind MEP Gerard Batten as interim leader, should Mr Bolton lose the vote. Up to a thousand UKIP members have registered for the event. The vote, to take place behind closed doors, will be preceded by speeches by Mr Bolton and a member of the party’s national executive committee, which expressed no confidence in him last month, triggering the ballot. When he was elected in September in the wake of its disastrous performance in last year’s election, Mr Bolton became the party’s fourth leader in 18 months. But his authority has steadily eroded since it emerged in December that the married father of two had left his wife and was dating UKIP activist Jo Marney, who is nearly 30 years his junior. Soon afterwards, it emerged she had sent offensive messages about Ms Markle, Prince Harry’s fiancée, before Ms Marney’s relationship with Mr Bolton began. In the messages, for which she has since apologised, she said black people were ugly and suggested the American actress, who is of African-American and white heritage, would “taint” the Royal Family. Mr Bolton condemned the remarks as absolutely unacceptable and indicated the “romantic” element of their relationship was over. However, the two have remained close since and he has said he is committed to helping Ms Marney – who remains suspended from the party pending an investigation but has continued to express her support for him on social media – through a turbulent period in her life. His handling of the episode has been widely criticised. A number of key figures have resigned from the front bench but Mr Bolton has insisted he can turn the party around and this week he published plans to draw up a new constitution and effectively axe the current NEC. 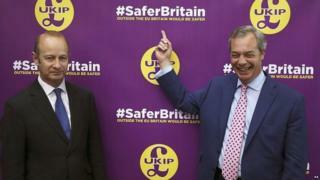 He received a major boost ahead of the vote when he got the backing of Nigel Farage, who remains an influential and respected figure in the party. Writing in the Daily Telegraph, Mr Farage said the party was in chaos with scores of local councillors jumping ship ahead of May’s elections and local structures “disappearing”. “I believe it would be better to allow Mr Bolton, with all his faults, the chance to turn UKIP into an electoral machine again,” he wrote.